The Great Lakes’ coastal wetlands are among the most diverse ecosystems in the United States. But after years of industrial traffic and development, the wetlands have shrunk by nearly 50 percent. Hoping to stem the tide of ecological damage, teams of researchers in the summer of 2011 began a five-year assessment of the wetlands’ deterioration. Capturing these efforts on film were Collin Erker and Erin Moffitt, both juniors in the University of Notre Dame’s Department of Film, Television, and Theatre. The pair spent four weeks filming the research teams to create a 35-minute documentary called WaterLogged. The students got support for their project through an Undergraduate Research Opportunity Program grant from the College of Arts and Letters’ Institute for Scholarship in the Liberal Arts—and from Gary Lamberti, professor and chair of the Department of Biological Sciences, who served as advisor on the project. The two faced many challenges, he says, including understanding and articulating complex research and adapting to difficult environmental conditions. Erker, who also majors in preprofessional studies (the College’s pre-med program), says it was biology graduate student Matthew Cooper who initially suggested the project to him. According to Moffitt, documenting the wetlands research was also an excellent lesson in the realities of documentary filmmaking. While continuing to promote Waterlogged, Erker and Moffitt are already at work on their next project. 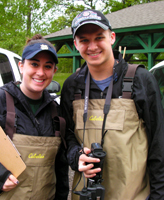 Originally published by Chris Milazzo at al.nd.edu on April 18, 2012.